Treat your guests to a taste of the Caribbean! A refreshing blend of strawberry and tropical flavors will tantalize your taste buds. 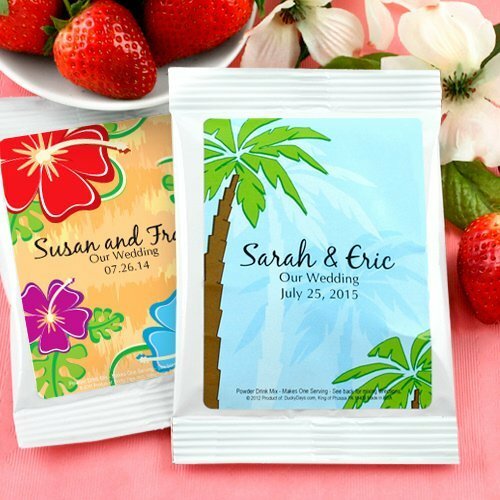 Our Strawberry Daiquiri Mix favors are available in a variety of fun and vibrant designs to coordinate with any theme. Each single serving drink mix comes in a white gloss pouch (4" x 5.5") with mix instructions and ingredients printed on the back. Make them uniquely you with three lines of text to create beach themed wedding favors your guests will love. Easy Assembly with self-adhesive labels, or for an extra fee we will apply the labels for you.